You can find and print these instructions here. Watch Ava used at a large event. 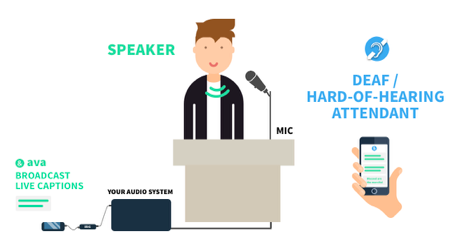 If you're in a venue equipped with an audio system, microphones and speaker, you can make it accessible for deaf & hard-of-hearing attendees, very easily. an iRig to plug into the smart device. 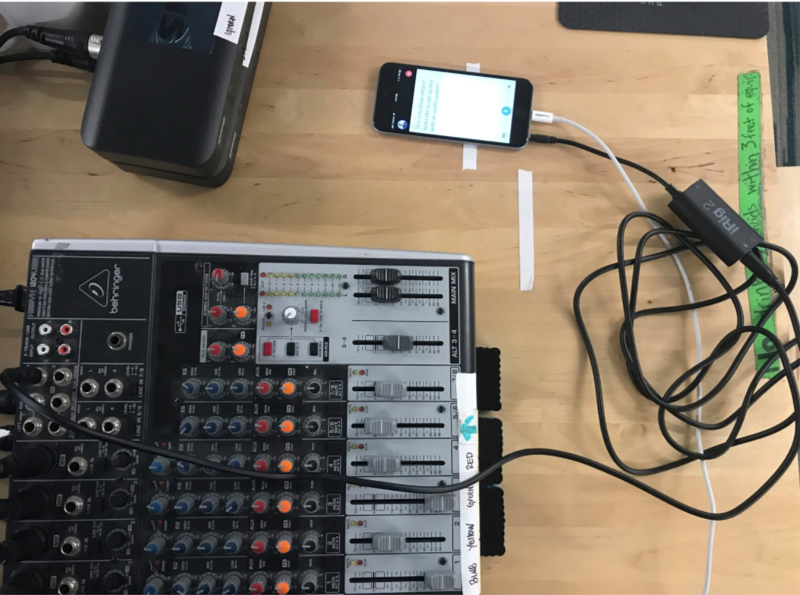 Tap Start Captioning, the microphone and speak into it. Can you see what you say appear on the screen? You're done with the setup. Look for the controller/audio system in the place, where the microphone sound goes in, and the sound goes out to speaker. Look for an available TRS outlet. (bigger than the jack outlet), and plug your TRS cable to this outlet. If you don't have one, look for the XLR, and plug the XLR cable. Plug the other extremity of the cable to the iRig. Turn the iRig on, and scroll the device to maximum volume. Plug the iRig final extremity to the smart device headphone jack. >>> Tap on the conversation status icon in the upper-right corner of the app. Select "anyone can join", and they select if you want to mute or allow your audience to use their microphone. >>> Select Start Captioning. When it is blue it'll be listening for spoken words to caption. Tip: Print this document bit.ly/ava-flyer-event, write there your location's Ava Name, so any newcomer to the location can follow instructions on how to receive the captioning. Print these materials: / and customize if you want. Here is a video to give you some ideas on how you can communicate Ava to your audience. Depending on the nature of your venue and activities, we advise you to use either Ava Event or Ava Welcome. Ava Event, for day-long events and conferences, allows you to organize sessions up to 12 hours at once. Attendees can come and go are when they want, and save the transcript of the sessions they attended. Only pay for the duration of your event, based on the number of rooms/stages. 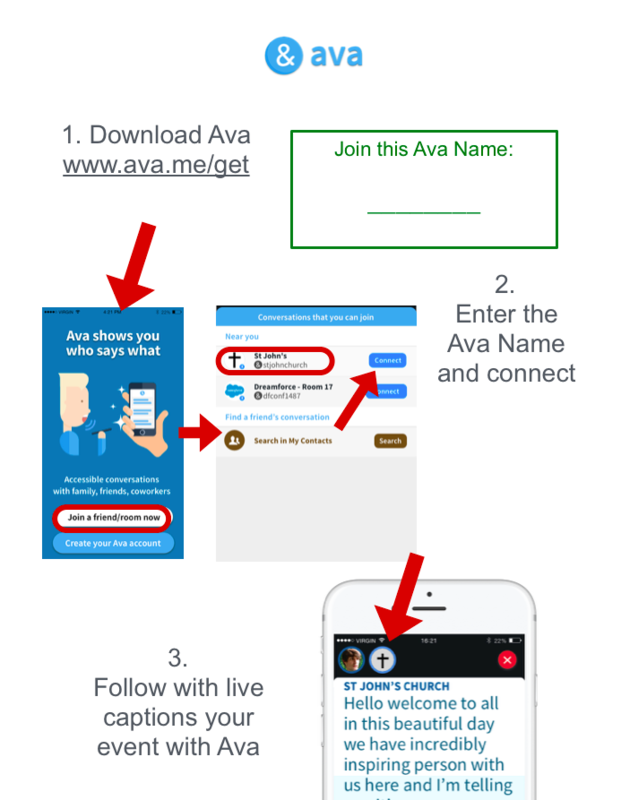 Ava Welcome, for stores, museums, worship centers, and others, enables you to make a location accessible to visitors at all times. Sessions up to 3 hours. Subscribe monthly and get 24/7 on demand service. For plan and pricing information go here. For other plans go here (not optimized for spaces/venues/events).